That said, there’s really no case that can’t be made better with a tempered glass sidepanel which is exactly what Phanteks recently added to their Enthoo Luxe. 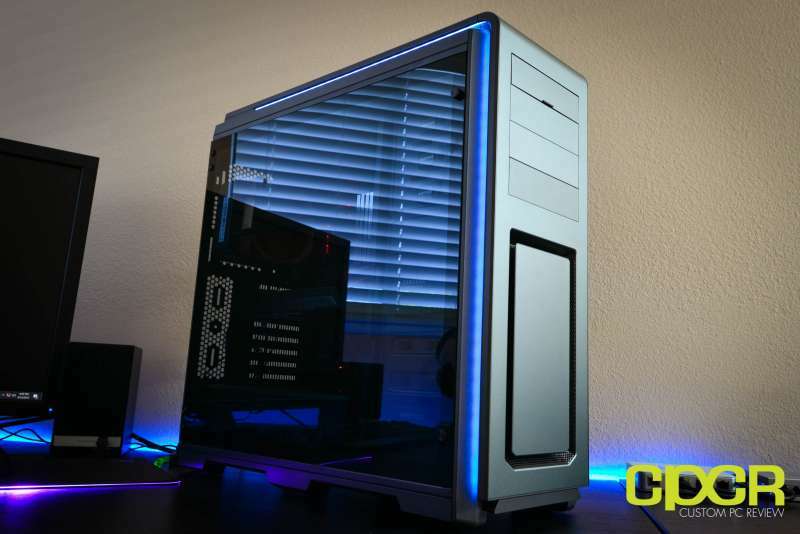 While I can resist reviewing a great full tower case, there’s simply something about a great full tower case with a tempered glass side panel that is simply irresistible. So, when the opportunity came to review the Phanteks Enthoo Luxe Tempered Glass Edition, I really couldn’t say no. Before diving in, let’s take a look at the specifications. 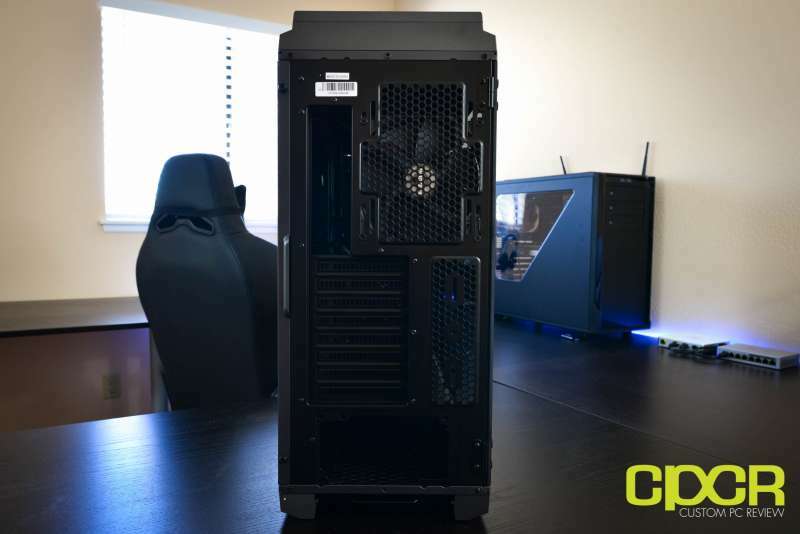 For those familiar with the Phanteks Enthoo Luxe, it’s a full tower case, so it’s a big case with support for everything up to EATX and SSI EEB form factor motherboards. There’s also plenty of expansion options as well as plenty of storage options as well. As far as the Tempered Glass Edition of the Enthoo Luxe, there’s very few changes that have been made aside from the obvious addition of the tempered glass sidepanel. SSD mounts have been added to the main compartment of the case for better visibility through the tempered glass sidepanel, the front 200mm fan has been swapped out for dual 140mm fans, and there’s a new grey option, but aside from that nothing much seems to have changed. Then again, the Enthoo Luxe was a great design to begin with and as long as Phanteks hasn’t screwed anything up, the Tempered Glass Edition should be a bit better than the original. 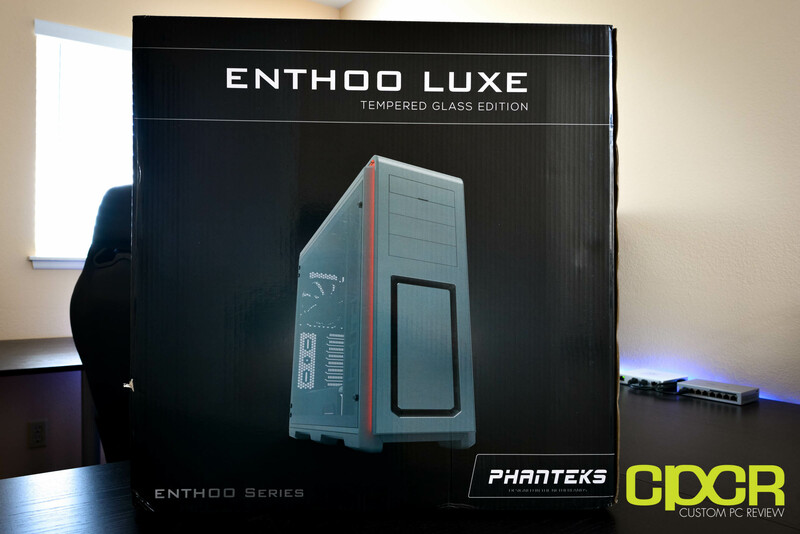 Here’s a look at the packaging for the Phanteks Enthoo Luxe Tempered Glass Edition. 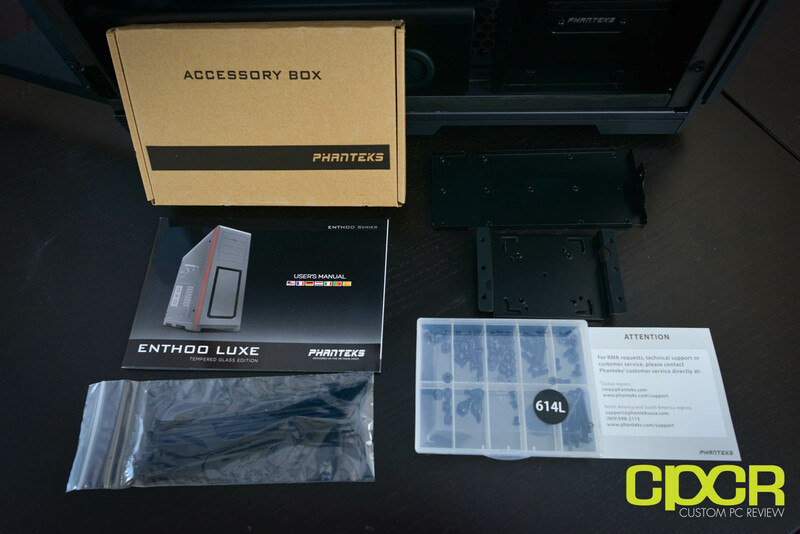 Included with the Enthoo Luxe Tempered Glass Edition is an accessory box which includes some documentation, a screw box, cable ties, a dampened pump bracket, and a reservoir bracket. The screw box is literally the best screw box I’ve ever seen come with a case. Mainly because I’ve never seen a screw box like that come with a case. Kudos to Phanteks for this. Here’s a look at the Enthoo Luxe Tempered Glass Edition. 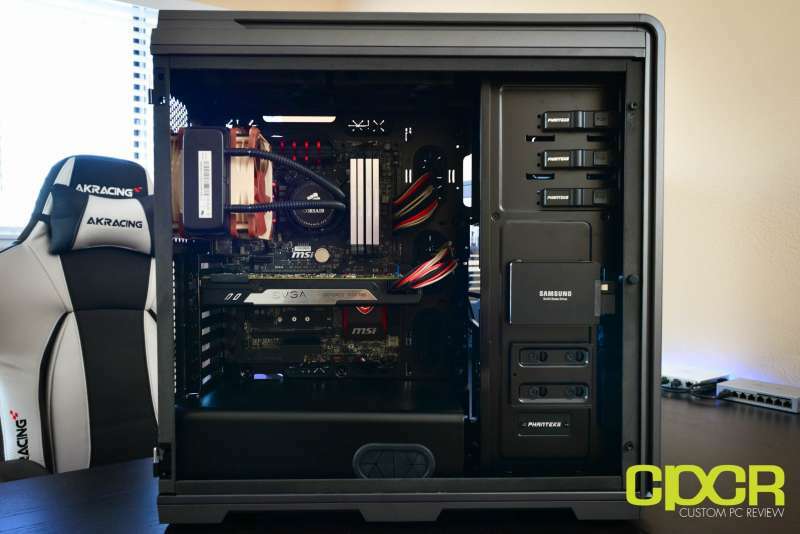 Looking at the front panel, we can see that half the case is devoted to a large hidden vent while the other half contains three 5.25″ drive bays with a fourth up top serving as a hidden I/O panel. The biggest feature of this case is the full sized 4mm thick tempered glass sidepanel which is absolutely beautiful. The tempered glass sidepanel is secured via two thumbscrews and once removed, the sidepanel automatically pops to allow easy opening of the case. The Phanteks Enthoo Luxe Tempered Glass Edition also features sandblasted aluminum faceplates which gives it that nice, premium aluminum look and feel, but doesn’t tend to attract fingerprints and oil as bad as typical aluminum. Here’s a look at the rear of the case. As it’s a full tower case, there’s eight expansion slots here. Phanteks has also pre-installed a 140mm fan, but there’s mounting holes for a 120mm as well. At the top, there’s a removable fan filter which also gives access to the fan array up top. A single 140mm fan is already mounted here, but an additional two more can go up here as well. Radiators up to 420mm can also be mounted with clearance above and below for a full push/pull fan configuration. The front panel can be removed entirely which is needed to access the fan filter or swap out the front panel fans. Phanteks has pre-installed two front panel 140mm fans. The top panel can be removed as well for access to the top of the case. Phanteks is also using standard screws rather than rivets in the Enthoo Luxe Tempered Glass Edition which will allow for easy deconstruction of the entire case for modding. At the bottom of the Enthoo Luxe Tempered Glass Edition is six large rubber feet mounted on built-in stands and two large dust filters. 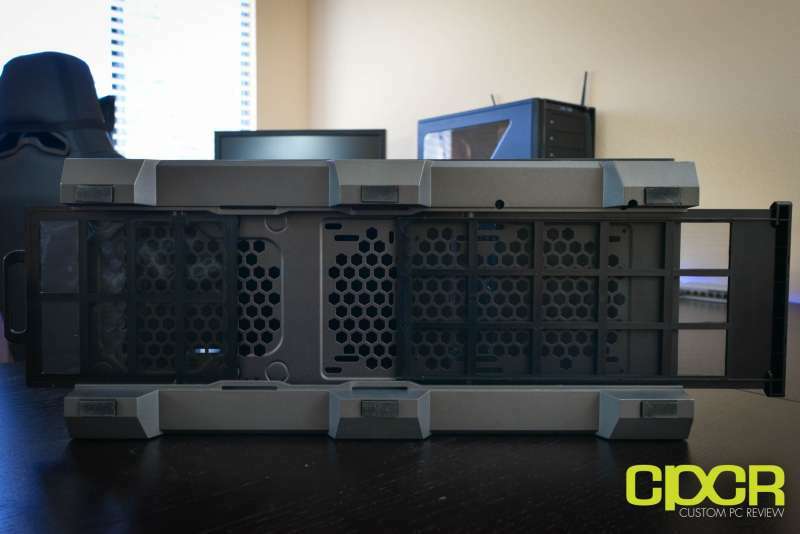 The bottom of the case is raised about 1.5″ off the ground thanks to the six built-in stands. This will allow the power supply to breathe with the fan intake mounted downwards. Swiveling the tempered glass sidepanel reveals the interior of the Enthoo Luxe Tempered Glass Edition. Immediately, we can see a massive CPU cooler cutout for easy installation or removal of aftermarket CPU coolers. There’s also plenty of space for even the largest graphics cards on the market with over 13.5 inches of clearance. For those who enjoy showing off their high end SSDs, Phanteks has also included two 2.5″ drive caddies in clear view of the glass sidepanel. These can however, be hidden if desired as two more 2.5″ drive caddy mounts are found behind the motherboard tray. Phanteks also includes a power supply shroud if needed for hiding cables. Here’s a look at the side of the Enthoo Luxe Tempered Glass Edition with the sidepanel removed. Back here there’s plenty of room to stash cables as there’s well over 1 inch of space. Phanteks has also pre-installed Velcro cable ties and has already pre-wired all the fans to an included PWM fan controller with a couple more fan headers still available for additional fans. The fan controller can be powered by a PWM header on the motherboard or via 12V SATA power. Inside the case is two removable drive cages which house six drive caddies designed for 2.5″ or 3.5″ drives. As expected, these drive trays are tool-less for 3.5″ drives. 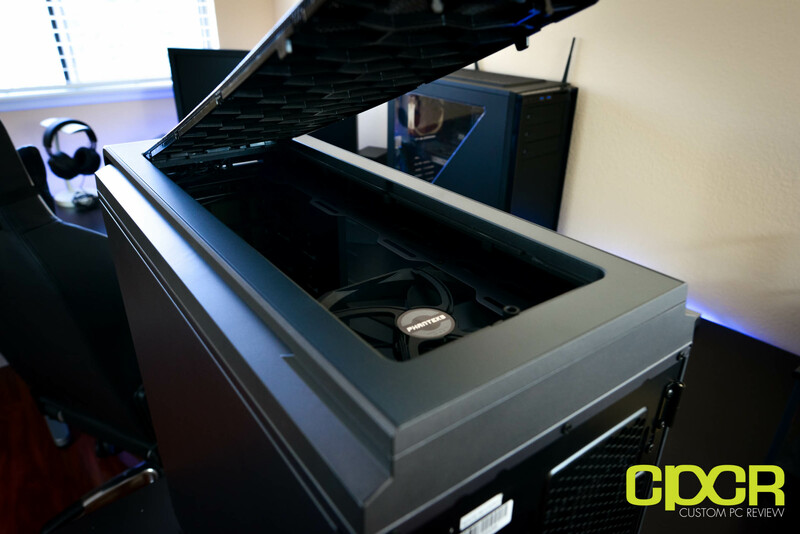 Those doing custom watercooling systems will find the HDD cage area an excellent spot for a pump or reservoir. 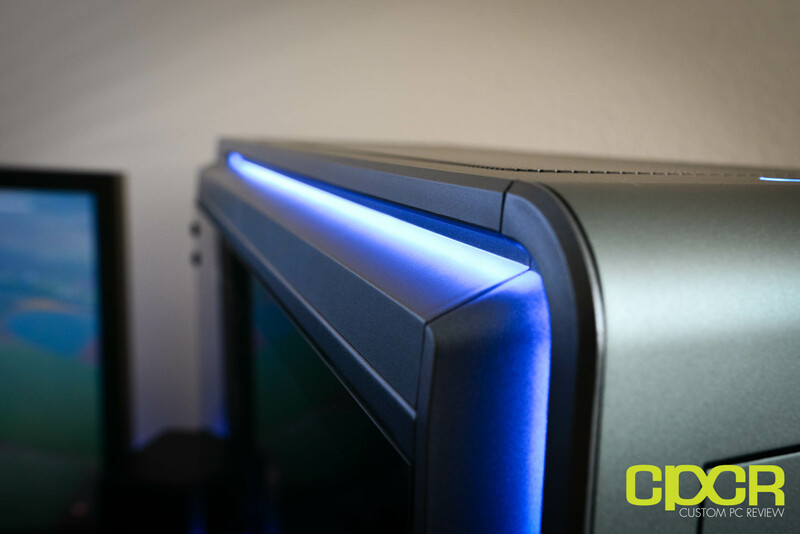 In order to make building into the case easy, Phanteks has included hinges that allow easy lift-up removal of the tempered glass sidepanel. Here’s a look at a system built into the case. 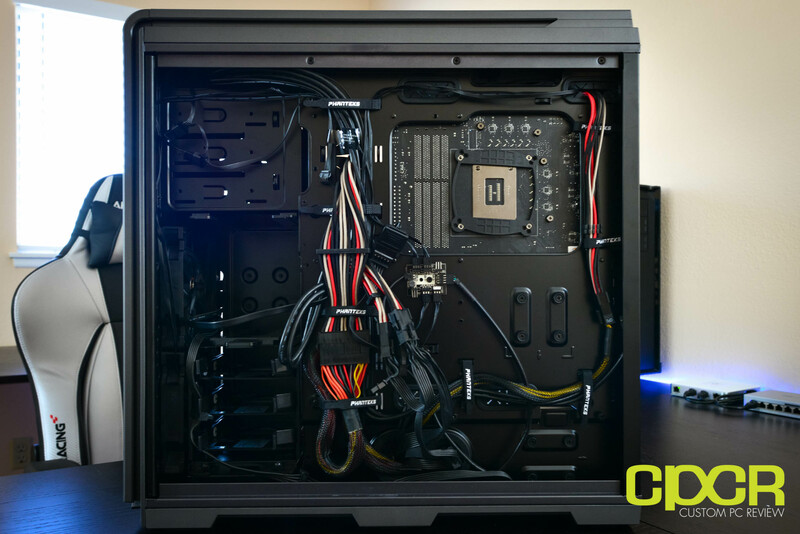 The combination of the power supply shroud along with the large cable grommets make it very easy to build a very clean system without a whole lot of work. As there’s plenty of space behind the motherboard tray, there’s really no reason to spend too much time organizing cables. However, the included Velcro cable ties make it easy to clean up at least a few of the cables. One issue I did run into however, is figuring out a way to run a cable to the SSD at the front. 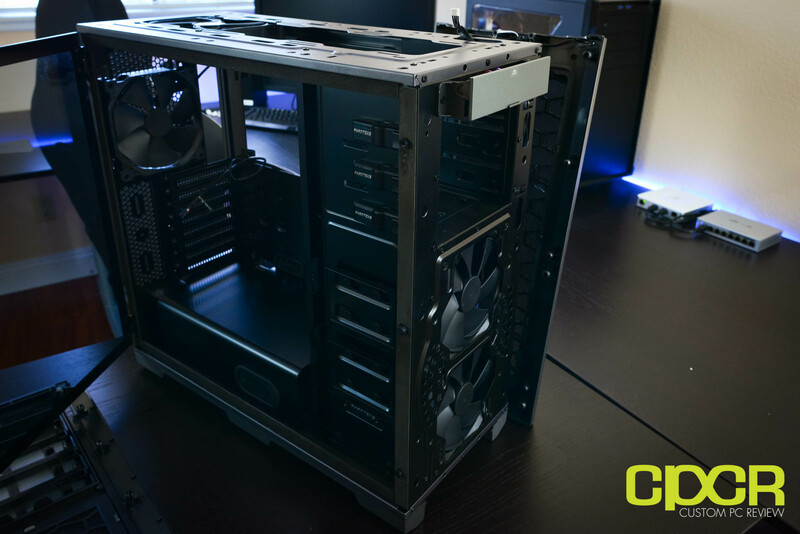 Unfortunately, Phanteks does not provide a whole lot of clearance with the HDD cages installed, so it’s a bit difficult to keep both drive cages and still run cables to the front. To solve this issue for our build, we removed the upper HDD cage to run the SATA and SATA power cables. Once powered on, the LED accent lights light up. Phanteks has six different colors available and is fully integrated with the Phanteks LED strip as well as RGB motherboards. 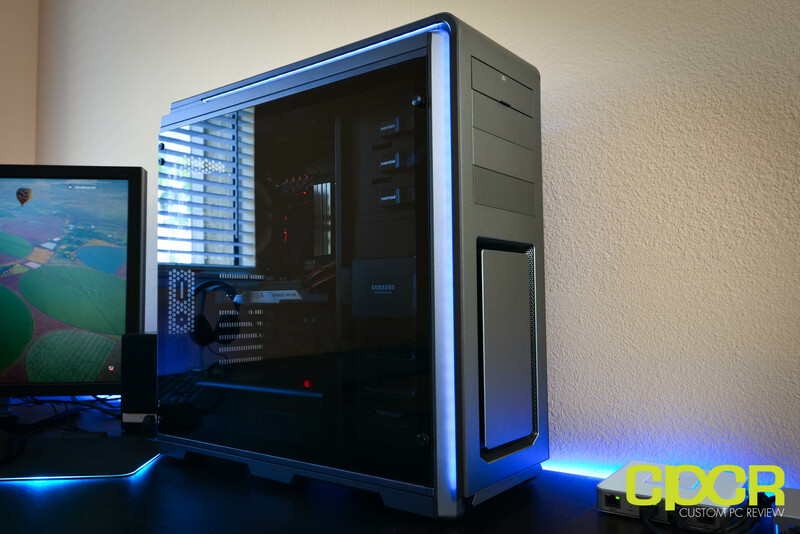 While the LED accents do run across both sides of the case, the side without a tempered window is super boring, so you’ll probably want to just stick with the tempered glass side when showing off. As expected, Phanteks has done a stellar job with the Enthoo Luxe Tempered Glass Edition. Considering it’s based off the Enthoo Luxe, there’s no surprises there. Once switched on, the case is very quiet as expected and the fans respond to PWM control from the motherboard so they spin up and down as needed. Huge props to Phanteks for integrating a properly working fan controller that isn’t just 12V full power to every fan or one that needs manual knob switching. Although I can’t speak for every build, at least in my configuration the four included fans were more than enough to handle cooling an Intel Core i7-6700K with a GeForce GTX 1080 without issue. Appearance wise, this case is phenomenal and pictures really don’t do justice to the beautiful tempered glass sidepanel that’s been outfitted to the case. The sandblasted aluminum is also a wonderful material for the panels which not only feels quite a bit more durable than cases that use plastic, but I personally prefer it to brushed aluminum as it attracts less oil and fingerprints. The LED accent lighting also adds a nice bit of personalization without being too tacky like some other cases. Build quality on the Enthoo Luxe Tempered Glass Edition is also stellar. The fit and finish is very good which is complemented by the high quality materials used on the case. While this raises the weight of the case to a massive 30 lbs, there’s no denying the 4mm thick sandblasted aluminum panels, 4mm thick tempered glass sidepanel, and the steel used in the interior really help make this case feel like it’ll last at least a few builds down the road as long as it’s reaonably well taken care of. Building into the case was also extremely easy thanks to the huge space available in the full tower design as well as the fact that the entire case is pretty much tool-less. There’s also a few little things that make things easier as well such as the swivel hinge on the tempered glass sidepanel that can be removed simply by lifting up. 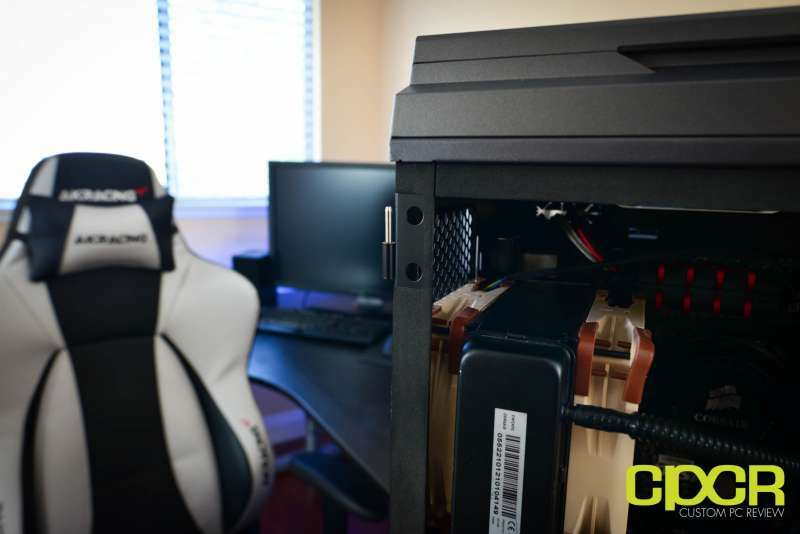 There’s also pre-installed cable ties for easy cable management, and the power supply shroud makes it easy to hide all the extra power supply wires right inside the shroud. The well placed quality rubber grommets also make routing cables a cinch and with all the fans pre-wired, standoffs pre-installed, and cable managed from the get go, there’s really little additional work aside from putting in the main components. The only major issue I experienced is a minor aesthetics issue when trying to wire a 2.5″ SSD in the main compartment. With both drive cages installed, this was pretty much impossible as there’s no clearance between the front panel fans and the drive cages. As a result I had to remove the upper drive cage however, this still leaves a huge hole in the area with an ugly looking SATA and SATA power cable running through the space. Luckily, you’ll have to look into the case at an angle from the rear to see it, but it’s there nonetheless. The SSD can however be moved to behind the motherboard tray in case your SSD is too embarrasing to show or you simply hate seeing ugly, unmanaged cables in your case. Either that or I’m sure somebody more creative than I will find some way to hide the wires. Pricing on the Phanteks Enthoo Luxe Tempered Glass Edition is $179.99 which is a very reasonable price for a full tower case with a tempered glass sidepanel. 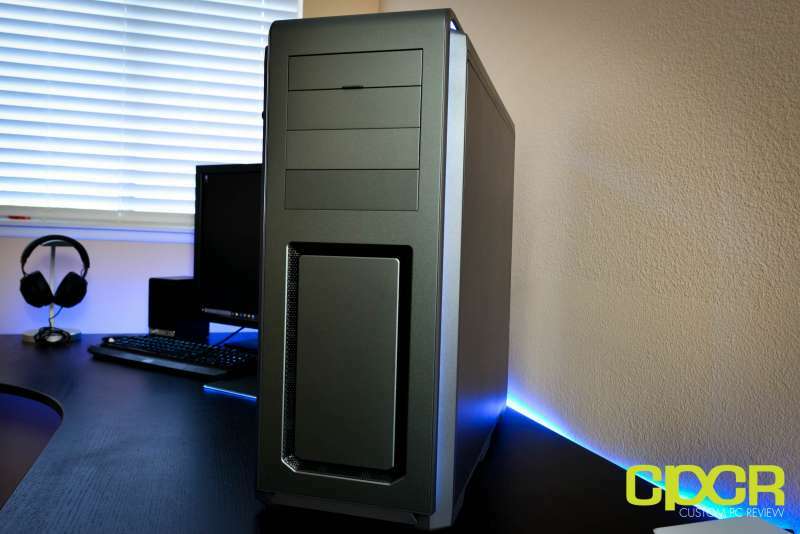 In fact, this is one of the few reasonably priced options if you want a full tower case with a tempered glass sidepanel. Luckily, the Phanteks Enthoo Luxe Tempered Glass Edition is an awesome case, so it’s an easy choice to make. Recommended! What about noise production? Is it quiet or loud? It’s quiet. If you want even more silence, you could upgrade the fans as well, but the design of the case does a very good job of isolating noise. What about air cooling? Can the front 200mm/2 x 140mm fan(s) bring in enough air into the case? I worry when the front panel is solid or mostly solid, there’s never enough air flow into the system. Also, would this be compatible with GIGABYTE’s RGB FUSION? On the website, Phanket only lists ASUS’ AURA and MSI’s Mystic LED strip compatibility. I want the GIGABYTE X299 AORUS Gaming 9 motherboard and want want LOTS and LOTS of RGB LED lighting!!!!! est ce que le panneau lateral en verre est adaptable a la version précédente luxe sans le verre trempé?